Lucille Lewin is a force to reckon with- she was the founder and Director of Whistles from 1976 to 2001 and the creative director of famed English Department Store liberty. Lucille left fashion for a career in sculpture with a Diploma in Fine Art and Ceramics from CityLit and has recently completed her Masters at the Royal College of Art where she won the young masters maylis grand ceramics prize. From December 2017 until February 2018 sees Lucille's first solo show at Connolly In Mayfair called 'The time Between Time' which sees her continue the work she did at the RCA and soon she will be represented by the Cynthia Corbett Gallery at Collect. You were involved in the fashion Industry for a very long time, what made you decide to leave the industry and pursue the Arts? We sold our business and I had the time to pursue my lifelong interest in the Arts. I had collected and been interested in sculpture, particularly sculpture and objects in clay, and works on paper and that is what I focussed on. What does Sculpture mean to you on a personal level? I relate to sculpture as I am interested in 2 and 3 D. The tactile and textural aspect and the ability to express oneself in space is important . I love the physicality of carving molding shaping joining. 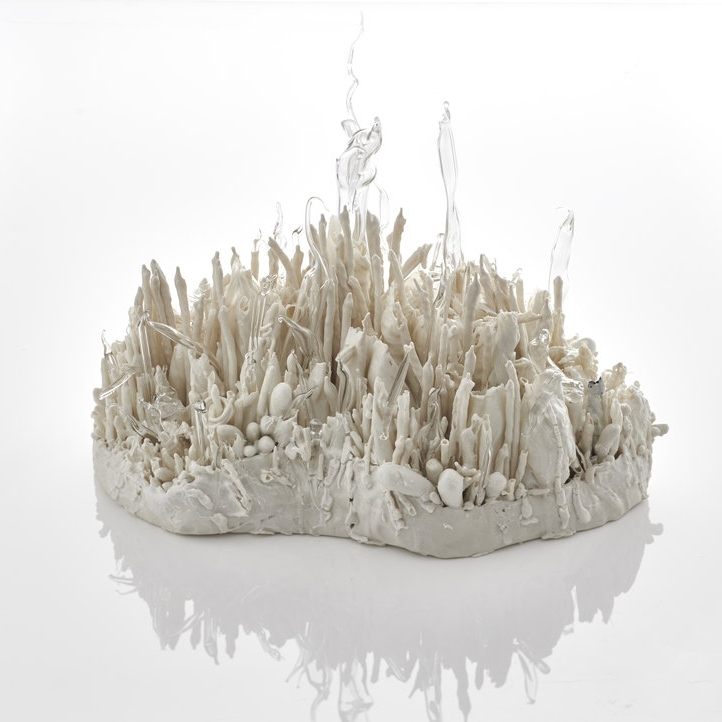 You recently completed your Masters at the Royal College of Art in London and won the Young Masters Grand Ceramics Prize- tell us a little bit about that experience? The Royal College of Art has the reputation of being the best art school in the world. Being accepted as a student is a fulfilment of a dream of being able to go there. Its reputation is unique and well deserved. The technique of teaching but not in the traditional sense of classes and lectures does not really exist in the same way anywhere else, where one is left alone to pursue a theme and help is given is you ask for it. It is studio based, practical and tutorial based and the whole College is Masters or PhD so one is expected to have confidence in one’s own practice and be able to defend what you set out to achieve. I have run my own business and felt able to work on my own. Winning the Young Masters Maylis Grand Ceramic Prize was a complete surprize as I was still at College and the short list of Artists were all extraordinary people who had much more experience and exposure than I did. It was a huge help to have won it at the time I did as it gave me a head start, and catapulted me much more quickly than I would otherwise have done. I had enormous press exposure, television interviews and many articles were written about the Prize. as much as the winning, it was the back story of how I had segued from fashion to Art and made a second career, and also the fact that I was 69 and doing all of this. In addition, my work is made in a quite unique way and does not really look like traditional ceramic work. 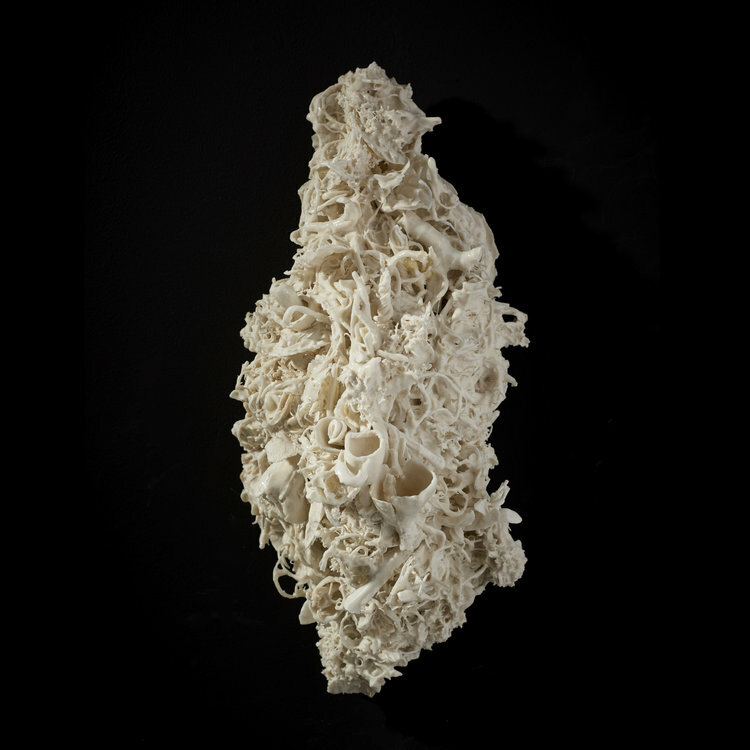 You predominately work with porcelain, glass and metal- why these materials in particular? I particularly like white, porcelain and glass, and found that one can get a great effect in the combination of materials. As I am predominantly a sculptor, material choice just represents another way of achieving something I am also very curious and being able to work in the Metal and Jewellery department and the Glass department was too much too resist. I love experimenting. I experimented with all sorts of materials in the Diploma I took at the City Lit, an adult education college in London. Tell us a little bit about your Solo Exhibition that is taking place from December 2017 until February 2018 at the Connolly in London? we are into our next phase. So, it’s a coda, it’s a moment where we are holding our breath, the world is in such a scary space at the moment politically socially and environmentally inevitably one’s work reflects and interoperates this. The “Garden of Earthly Delights’ by Hieronymus Bosch inspired your Alchemical Bodies collection. You examine form, chemistry and process and reference the Victorians Cabinet of Curiosities- would you tell us a little bit more about this body of work. 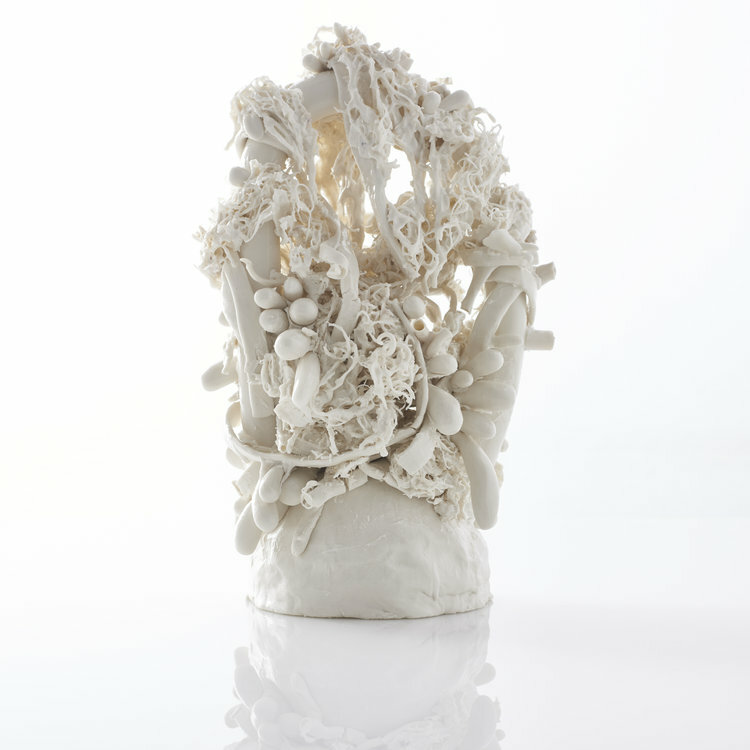 The first set project at the RCA involved research at the Victoria and Albert Museum and there in the Ceramic Halls, I became fascinated by the very first European attempts to copy the whiteness and the translucence of Eastern porcelain. I researched the attempts by early 18th Century Alchemists to accomplish this. A lifelong fascination with all things other, curious, grotesque Alchemy, Fairy Tales, Hieronymus Bosh, the early Victorian scientists and botanists and photographers, all come together in the first body of work at the RCA called, Alchemical Bodies and which became the subject of my dissertation too. Inspiration is a defining element for any creative- what inspires you on a daily basis and where do you find your inspiration? Invariably an artist’s work is connected deeply to that artists psyche and to a large extent is autobiographical. The natural world, the larger community of artists both past and present, the world of dreams, all collide to make my work my work. I spend hours in Museums the Pit Rivers in Oxford, the Science museum and the Victoria and Albert, and of course the British Museum. How can one connect with you and your work? I am on Facebook and twitter, but rarely use these platforms preferring Instagram as it is visual and part of my practice. I have a studio in London and am in the process of setting one up in Plettenberg Bay, South Africa. Any new projects or events on the horizon that you would like to mention? I am showing with the Cynthia Corbet Gallery in The Sachi Gallery in London in Feb and The London Art Fair in January 2018. What advice would you give to anyone wanting to get into the art or any creative Industry? The Art or the Creative industries are just that, Industry’s (sp!) and success depends on 90% really hard work and the 10% divided into talent luck and determination. Finally if you could sum yourself up in a sculpture, what would it be and why? I would be a box of eggs. Eggs are simply shaped perfectly designed for their function. This simplicity belies what happens inside and what is created and what is produced . Endless curiosity . Endless creativity . And every creation is unique .